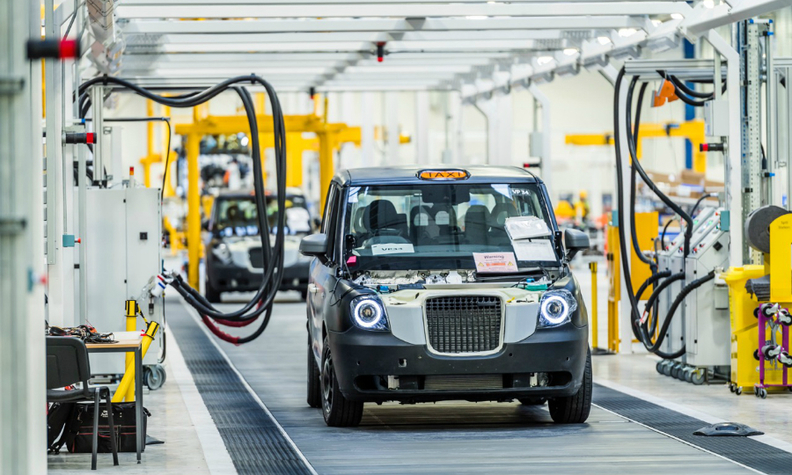 Production of the TX5 black cab begins in the UK. LONDON -- The London Taxi Company opened a new factory in central England on Wednesday to produce electric taxis which it also hopes to sell overseas for the first time to cities keen on the famous brand and concerned about pollution. The plant near the city of Coventry is Britain's first electric vehicle factory and will help the firm to expand overseas as part of a 300 million-pound ($375 million) investment. The TX5 model, which will replace the FX4 that dates back to 1958, has a lightweight aluminum body structure, composite paneling and a range-extending battery-electric propulsion system with a gasoline engine used as a generator that London Taxi says will make it possible for the cab to last an entire service day without needing a recharge. The new Black Cab, which was created at owner Zhejiang Geely Holding Group's styling center in Barcelona, Spain, with help from 200 UK-based engineers and designers, will also offer Wi-Fi capability and charging points for the driver and passengers. The move is the latest stage in the turnaround of a company which was saved from bankruptcy just over four years ago by the Chinese company and is also a welcome boost for the UK as it prepares to start divorce proceedings from the European Union at the end of this month. "This plant, and the related investment, is just one symbol of my own and the wider Chinese confidence in the UK," Geely Chairman Li Shufu wrote in an article in the UK's Daily Telegraph. The first electric taxis will go on sale in Britain in late 2017 with sales in Europe due at the start of next year. From January, all new cabs in London must be zero-emissions capable, according to rules introduced by the mayor of London. Executives from the taxi maker, which traces its origins back to 1899, have visited cities such as Oslo, Amsterdam, Paris and Berlin in recent months, but have yet to decide on the first foreign market. "Today marks the rebirth of the London Taxi Company. A company with a singular vision; to design and build dedicated urban commercial vehicles that can operate without emissions in cities around the world and bring down running costs for drivers," said CEO Chris Gubbey.